In response to anti-women legislation in the General Assembly, a new political action committee was launched just days ago. The Women’s Strike Force, a bipartisan effort, is raising money to recruit and support candidates who challenge those legislators who supported the legislation. The group was mentioned on the Rachel Maddow show on the day it was launched. With the mention, the group raised money from 40 states, an impressive feat for a new organization. Women’s rights are neither Republican nor Democratic. Neither are they solely within the realm of just women. So I urge everyone who believes in the rights of women to support this effort. The group’s Facebook page can be found here and the twitter feed here. You can sign up for more information here and, of course, donate. 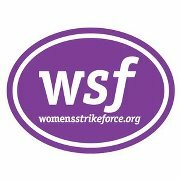 Kindly accept this donation in support of the Women Strike Force’s effort to put a halt to the relentless assault by Virginia elected officials on women reproductive rights. This is truly a women’s health issue that affects everyone. I am absolutely horrified that this assault on women reproductive rights has the potential of laying the groundwork for returning to the time-of-old, when women were forced to use back-alley procedures that in some instances resulted in death. It is utterly appalling that today such dramatic and devastating legislation regarding a woman’s personal choice can surface and be enacted in law absent extensive public debate or majority public consent. It’s also frightening that Virginia elected officials are supporting legislation that allowed employers to deny women health insurance coverage for anything that the employer finds morally objectionable. A women’s decision to abort is well decided before she enters a facility for the procedure. As such, to suggest that this wave of women’s reproductive legislation is beneficial to women – “adds insult to injury”. If such a procedure is necessary or beneficial, the doctor and patient will decide — not a politician. Additionally, such legislation will do nothing more than try to foster guilt or shame on the women who finds herself in need of the procedure, as well as, create financial obstacles by denying health insurance coverage and requiring women to paid for a medically unnecessary procedure. This assault against women and their health care choices is a giant step backward. Hopefully this donation can assist the Women Strike Force’s efforts in actively recruiting candidates of all political parties who support women’s reproductive rights. I agree – and thanks for your contribution! What an amusing euphemism — “reproductive rights” — when the whole point of those “rights” is to NOT reproduce. And what an amazingly uniformed comment. Ask your mom or other woman close at hand about reproductive rights and health. It’s clear you have no idea what you are talking about. What it boils down to for the vast majority of cases is that two people made a CHOICE and do not want to deal with the natural consequences of that choice. It is not about CHOICE. The CHOICE was already made. Now, having made that bad choice (probably many times — pregnancy is not automatic), they want to make another — the CHOICE to end a life that they are responsible for.